With regard to the dawns, the Earth has one second important characteristic: it is a magnetized planet. In the absence of solar wind, the shape of the magnetic shield of the Earth would be about that of a dipole, extending in any direction towards the infinite one. The interaction of the geomagnetic shield and the solar wind can be compared with that of a supersonic wind (Mach 8) on a car: a shock wave is formed with before (with 15 terrestrial rays approximately) and forces the particles of the solar wind to marry the shape of the geomagnetic field. Practically no particle can cross the border on which the pressure of the magnetic field compensates for that of the solar wind. This border is called the magnetopause and is typically located at 10 terrestrial rays side day, value which can go down up to 7 after strong solar eruptions. The interior of this cavity, relatively protected from the solar wind, is called the magnetosphere. It is compressed towards the Earth side day, and extends in a long tail stretched by the solar wind side harms, which gives him a little the shape of a suppository. 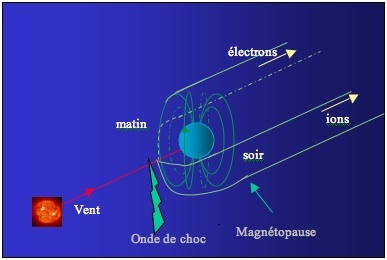 Illustration showing the shape of the magnetosphere. the ones running out side morning, the other side evening. However, the magnetopause is a porous border. While skirting it, part of the particles of the solar wind manages to derive and penetrate in the magnetospheric cavity. Others meet side harms a distance from approximately 30 terrestrial rays, in the zone known as of reconnexion. Under the effect of the collisions, part of these particles from goes away in space, whereas the other part is brought back towards the Earth. The geomagnetic field banged the door with the nose of the solar wind, but this last returned all the same via the window! In an extremely simplified way, side day, the solar wind, while approaching the Earth, “sees” the geomagnetic field which, according to the laws of Amp, creates a separation of loads. More ions derive along the magnetopause west coast, and more electrons east coast, generating an electric field which crosses all the magnetosphere side harms. Under the combined effect of this electric field and geomagnetic field, the particles which are found in the magnetosphere undergo a strong acceleration. The speed of the electrons increases until several tens by thousands of kilometers a second! However, more they approach our planet, more the intensity of the geomagnetic field is high. With some terrestrial rays (from 5 to 10), it becomes so intense that the electrons and the ions can continue: they are constrained to whirl around the Earth in a gigantic ring of current called the belt of radiation of Van Allen. During this whirling, early or late, these particles undergo collisions which make them deviate towards north or the south indifferently. They follow the local magnetic field then to be precipitated towards the atmosphere. In 3 space dimensions, it is to better represent the geomagnetic field by shells that by lines: the particles do not fill the zone ranging between two lines of the magnetic field, but rather volume between two shells of the magnetic field. The feet of this volume where the belt of radiation passes trace on the Earth two ovals called oval auroral, typically located between 65° and 75° latitudes north and south. These two ovals exist permanently, because the solar wind blows continuously.